Our mission is to actively work to improve our society and the environment. 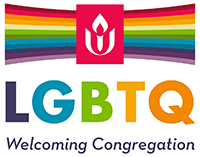 Reaching out to the community beyond our church walls has been a customary practice of Unitarians and Universalists since their beginnings centuries ago. Our minister, along with members of the congregation, is active in interfaith collaborative projects such as environmental awareness, food for local food banks, and social action events. We’ve begun an Ecological Land Ministry on our own Property. Our youth also participate in these programs, including support for cultural diversity at the Bowling Green International Festival, where they sell fair trade coffee and chocolate. We also set aside our morning offering every third Sunday of the month to support social action programs and charities, including relief for victims of natural disasters. Our Social Justice Action Committee recommends the recipients of the offering each month. For more information, visit the Third-Sunday Beneficiary Page. We participle in the 12x12x12 Program, which helps provides food supplies to hungry people in our area. To do this, we recruit twelve people from our church who each provide $12 worth of food items or $12 (either cash or check) for the next twelve months. The money and food are then given to Manna Mart, which is the HOTEL Inc. food bank. Through Guest at Your Table and other programs sponsored by the Unitarian Universalist Service Committee, we donate to people around the world. Some of us travel to other countries to offer our services. Additionally, we study social justice issues to become more aware of injustices and ways we can help make a difference. Our minister frequently preaches about how our food is produced and ways in which we can be socially responsible in the choices we make.We then take action on issues by attending rallies, writing to our legislators and elected officials, and providing a location for groups to meet. 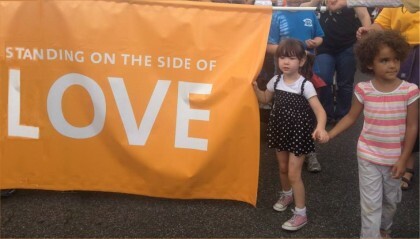 Unitarian Universalists are “standing on the side of love” and actively work for marriage equality, GLBTQ rights, and access to good food and clean water. to actively work to improve our society and the environment!